I'll be in Basel, Switzerland from September 6 through September 12. It doesn't look like there are many brewpubs in the area; any suggestions on where to find the good beer? Thursday, August 7: The Princess of Darkness Porter and the Abtskelder Tripel went on tap. Friday, August 8: A tour group came in at 9:00am, but by 10:00 Paris and I had loaded up the car and were on the road to Madison. 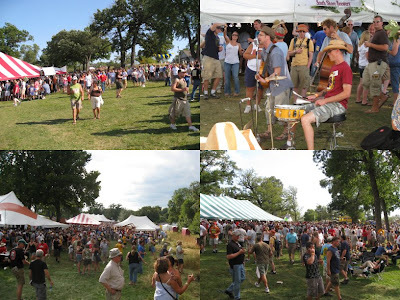 Saturday, August 9: The Great Taste of the Midwest! 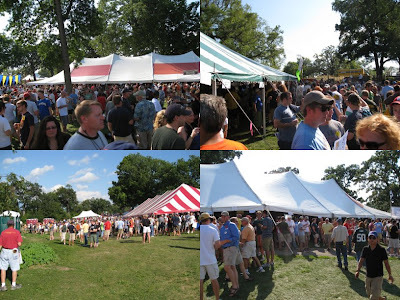 Featuring 115 breweries and probably four or five hundred beers, and attended by some 5,000 beer lovers. We had attended this fantastic fest on behalf of some of my previous employers, and after an absence of a few years, the organizers graciously invited us back. 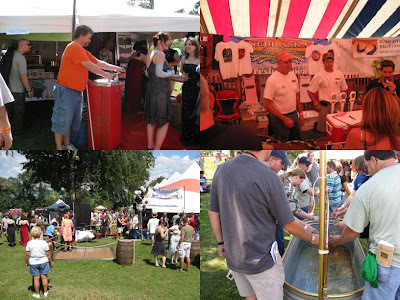 (Nebraska Brewing was the only other brewer in attendance from this state.) 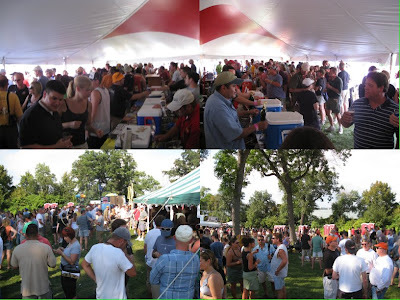 We poured the Porter and the Tripel, as they were enormously popular beers from the Egan Brewing days. Monday, August 11: Gave a couple of tours this evening. Wednesday, August 20: I haven't brewed for quite some time. Lately, it's because my hot liquor tank was significantly iced up on the inside. But over the past few days, I got it all melted and figured out what the problem was, and today I finally got to brew this year's Oktoberfest beer. Thursday, August 21: Brewed a batch of All-American Gold. Friday, August 22: Brewed a batch of Toil & Trubbel Dubbel. 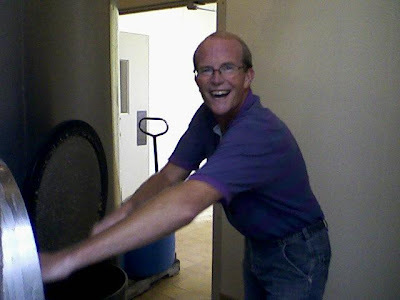 Gottberg regular John Fredrickson did most of the heavy work, as this happy picture attests. Left to right: Ann, Ryan, Angela, John, Richard, Brian, and Marisa. Not pictured: Paris. Several of the gang came to our house afterward to enjoy the bounty of our cellar. Left to right: Unibroue Don de Dieu, Verhaeghe Duchesse du Bourgogne, O'Hanlon's Thomas Hardy Ale 2006, Sierra Nevada Bigfoot 2001, JW Lees Harvest Ale 2002, Boulder Killer Penguin, Great Divide Yeti, Anchor Old Foghorn 2004, Unibroue Maudite, Cantillon Classic Geuze, Unibroue Edition 2005, Goose Island Matilda 2006, Eggenberg Samichlaus 2004, North Coast Old Stock 2004, JW Lees Harvest Ale Lagavulin 2006. Not pictured: Unibroue 15, Unibroue 16, Unibroue 17. I'd like to brew a couple of times this week (maybe even a Weizenbock) and I'm doing a beer tasting in Hooper tomorrow, but otherwise it looks to be a pretty quiet week. Paris tells me there's a trip to Basel, Switzerland in our near future, but we don't know the dates yet. Avery Rolls Out - "Ale to the Chief"
Read the whole story at The Colorado Beer Examiner. 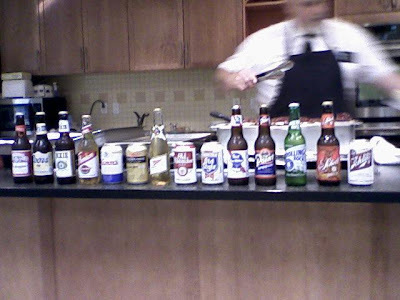 Last Wednesday, the HyVee in Council Bluffs hosted a tasting of "old-school American pilsners", hosted by Beer Specialist KJ Harnack. 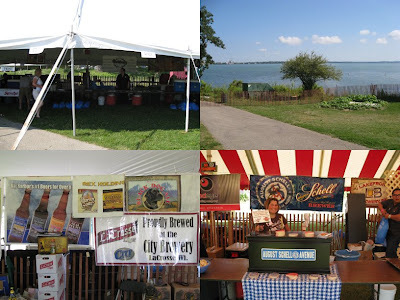 Along with a tasty meal of meatloaf, corn on the cob, and a baked potato, we attendees were presented with a list of fourteen beers and fourteen samples of beer, one at a time. KJ asked us to guess which beer was which, with prizes going to the best guessers. Pale golden. Thick head. DMS, grainy aroma. Light body, creamy. Sweetly grainy. Very clean. Pale, moderate head. Clean aroma, fruity, with a hint of sulfur. Light body, moderate carbonation. Really sweet, with a mild malt flavor. Some sulfur. Sweet finish. Pale golden. Thick head. Very clean aroma, just a hint of sulfur. Light body, smooth. Mild grainy malt character and just a hint of bitterness up front. Pale hazy yellow. Low head. Some DMS, clean aroma otherwise. Light body, smooth. Sweet, malty, earthy. Bright pale yellow. Low head. Some DMS aroma, with some grainy malt. Light body, smooth. Really sweet and fairly grainy. Flash of noble hop flavor at the end. Pale yellow, some haze. Thick head. Phenolic, formaldehyde odors. Light body. Sweet. Buttery. Fruity. Pale golden. Thick head. DMS aroma. Light body, moderate carbonation. Sweet, grainy, and sweet, but it finishes clean. Pale golden. Thick-ish head. DMS, SO2, grainy aroma. Light body, moderate carbonation. Sweet and sulfury. Some resiny bitterness late. Pale yellow. Thick head. Grainy, DMS aroma. Light body, moderate carbonation. Sweet and grainy. Sweet finish with a mild grassy floral hop flavor. Golden. Moderate head. DMS aroma, sweet and grainy. Light body, moderate carbonation. A bit grainy, mildly sulfury. Clean sweet grainy finish. Pale golden. Big thick head. Very mild DMS aroma. Light body. Really sweet malt flavor. Pale yellow. Thick head. Sulfur and green apple aromas. Light, fizzy. Fairly sweet malt, clean all the way through. Very pale. Thick head. Clean, mildly sulfury aroma. Light, fizzy. Fairly sweet all the way through. Very pale. Thick head. Some DMS aroma, mildly sulfury. Light, smooth. Really sweet and fairly sulfury. That's right...one correct out of fourteen. I thought at least I'd get Old Milwaukee right. I found it interesting that all of my descriptions used the same words in various arrangements. Except for Dixie, these beers all pretty much tasted the same, which isn't really much of a surprise.